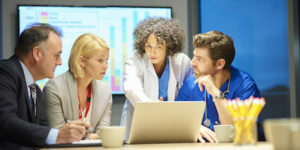 Healthcare online reputation management has become an essential part of healthcare marketing and patient relations for healthcare organizations. In a world that’s focused on returns, healthcare reputation management yields opportunities for ROE – Return on Engagement. Like ROI (return on investment) or ROAS (return on ad spend), ROE is a metric you can use to track your brand strength gained from interactions with your patients. Why does ROE matter for Healthcare Marketers? More and more, patients spend time online researching healthcare providers before selecting a practice or hospital for their care. With our own research showing that 95% of people find online ratings to be reliable, and Brightlocal reporting that 85% of people trust online reviews as much as a personal recommendation, more healthcare organizations are developing their own reputation management programs. Patients aren’t just looking for quality reviews, they are also looking for volume. They want to know that the physician they are thinking about visiting doesn’t just have a few people saying they are great – but many. Medical facilities or practices are more likely to appear in search results if they have a lot of good reviews. We’ll get into volume later. So if healthcare consumers are being active and engaged in their medical needs, are providers engaging with them online? In today’s digital world, informed patients expect the same kind of interaction they receive from hotels or their favorite retailer. Responsive engagement is the key to a good online reputation for healthcare providers. For instance, if a patient posts a negative comment from your waiting room, you may have the opportunity to resolve the issue immediately if you’re actively monitoring and responding to comments. By having a plan in place for responding to negative reviews, we’ve seen many cases where patients have changed a negative online review to a positive one, or removed it, after marketing engaged them and helped facilitate service recovery. One important result of engagement is – more engagement. Our customer success team reports that reviews tend to increase in number, especially when the practice regularly engages and responds to patient feedback. When prospective patients see that the practice is listening and responding, this encourages further patient engagement. Patients want to share their good experiences with the world and healthcare marketers can get the best ROE when they provide a convenient way for them to do so. Remember what we said about volume? Both users and search engines like seeing more reviews. In other words, if you are doing a good job responding to user feedback, you are probably going to see some positive results in your search rankings and in your patient acquisition efforts. As vital as it is to manage online reviews on third party websites, you also need to engage prospective patients on your healthcare organization’s physician directory pages. An effective tool can help support the program. Providence Health & Services (PH&S), the fourth largest not-for-profit health system in the United States, is doing just that. They’re managing ratings and comments from patient experience surveys and publishing them on provider pages. In 2015, PH&S rolled out our transparency solution across its Oregon market, with star ratings and reviews published on more than 500 of its physician profile pages. Several months in, an analysis of 86 primary care providers and 64 specialists (150 physicians in all) revealed a dramatic effect on consumer behavior. You can read more about it here. How are bad and good reviews impacting your providers and organization? Engaging with online reviews can help maximize your online presence, increase patient acquisition and loyalty, and improve your reputation. Your physicians and management will appreciate it. Healthcare reputation management can be tricky or even daunting based on how many reviews you receive across multiple platforms. That’s where we come in. Here are some best practices on responding to online reviews.